Some of you may be aware that I used to keep a Northern Water Snake. (Yes, I had a licence for her.) She was born in captivity, and was astonishingly handleable and even ate mice, so she was a breeze to keep. She was also an amazing asset at educational displays: most people around here are deathly afraid of water snakes, which at their most basic are simply big garter snakes adapted to a diet of aquatic animals (if water snakes are feisty when caught, so too are large garter snakes). So a tame water snake was very, very useful. When I moved to Quebec in 2003, I couldn’t keep the snake — provincial law does not allow for the keeping of protected species by private individuals — so I passed her over to a friend, who promptly got a licence for her. You can see where this is going, can’t you? 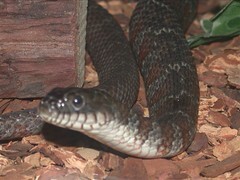 The owner wrote to say that the water snake was found dead last night. She would have been seven years old, which is kind of young for a water snake, but not excessively so. She almost certainly was carrying the same heavy parasite load in her lungs that, you may recall, killed so many of my other garter snakes. (The culprit, you may remember, was live — or at least whole — fish that carried those parasites.) That she held out as long as she did says something about her — or her species’ — resistance to big internal worms: she was almost certainly the last or next-to-last snake that was fed the contaminated batch.